"Something to be proud of this time. General Lee should be very gratified." 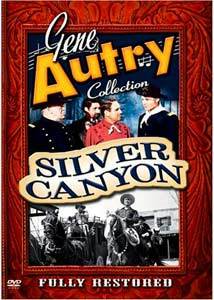 The standard scenario for Gene Autry westerns was to use modern-day settings (probably for reasons of economy), but with the trappings of the old West. For this outing, however, the setting is the Civil War, and the shift in setting benefits the production by giving it a more authentic flavor. In the West, guerrilla raiders are a serious problem for the Union, and the volunteers to take help take them on include Army scout Gene Autry (himself) and Pat (Pat Buttram, having recovered from the injury that required Smiley Burnette to fill in for Whirlwind). But the Army thinks that it has a better use for Autry, who knows the terrain better than anyone, and suggests that he infiltrate the gang. Pat, upon finding this out, deserts his assignment to help Gene unravel the riddle of where the guerrillas, led by dandy Wade McQuarrie (Jim Davis, best known as Jock Ewing from Dallas), are hiding. Gene tracks them to an Army outpost commanded by Col. Middler (Edgar Dearing). Gene gets caught between the colonel's son Walt (two-fisted Western star Bob Steele), who covertly supports the guerrillas, and daughter Dell (Gail Davis), who opposes them. Although Autry had appeared in Civil War and Reconstruction-era films on a few occasions, he was usually depicted as having been on the side of the Confederacy, but here his allegiance is to the Union, probably in deference to the political climate of the early 1950s. Buttram is cranky as usual, and has some good moments with his array of good luck charms, which invariably go bad, while Gail Davis gets the usual thankless development of disliking Gene and gradually coming around, true to formula. The leader of the guerrillas is an oddly foppish character, which hardly seems in keeping with the equivalent of Quantrill and other desperate raiders. The action quotient is pretty high in this installment, with some lengthy fistfights and quite a lot of gunplay, but of course no blood is seen onscreen. Some well-rendered chase sequences are highlights as well, making this a cohesive and thrill-packed little adventure. Politically it's interesting too, with echoes of The Ox-Bow Incident in the opening sequence as a doctor is very nearly lynched by a mob. The songs get short shrift again, with Ridin' Down the Canyon (repeated twice) and Fort Worth Jail the only tunes. Image Transfer Review: Although there's significant grain in the full-frame image,m it's quite attractive and not sparkly. There's some modest flicker in white areas of the screen, but the greyscale is otherwise very good and black levels are deep. Detail is acceptable and textures are frequently vivid. The source material has been restored to near-pristine condition, making for a pleasant viewing experience. Audio Transfer Review: While its companion release Whirlwind has rather noisy audio, this disc is quiet and clean for the most part, with only occasional mild hiss intruding on occasion. Dialogue is quite clear and the background music vivid. The songs sound fine, with very clear tones to the guitar. Extras Review: Gene Autry Entertainment continues to roll out an impressive array of extras in support of the feature. The Melody Ranch Theater segments (10m:27s) focus on Gene and Pat reminiscing about Jim Davis, and Pat tells some humorous stories about Gene's impact on a Zulu tribe and an unreconstructed Confederate soldier. The Melody Ranch radio show from September 22, 1951 is included in its 29m:06s entirety, with the Juicy Fruit commercials intact. Pat Buttram gets a special focus on this disc, with segments devoted to him from a souvenir program from 1950, a lengthy bio and selected filmography. The bio and filmography for Gail Davis are also back, along with a 3m clip from the Annie Makes a Marriage episode from her Annie Oakley television series. Full episodes from this series would make an attractive extra for future volumes that feature Davis prominently. A list of the five seasons of episodes from Autry's television series is included as well and those too would make for good extras if they are still extant somewhere. Wrapping up the package are a Variety review from June 13, 1951, the day after the premiere, and galleries of five dozen stills, four lobby cards and two posters, plus the press kit materials for the picture. A more action-filled adventure than the usual Autry outing for Columbia, with a strong historical background. The transfer's very good and the extras are the usual copious extravaganza.